Flitwick Mowers Limited the registered office for which is 101 Wootton Road, Kempston, Bedford. The trading address is Unit 7 Lyall Close, Flitwick Industrial Estate, Maulden Road, Flitwick, Bedfordshire. Company registration number is 04744815. VAT registration number is 491 1553 47. Upon receipt of your order we will, as soon as is reasonably practicable, send you confirmation by e-mail whether we accept your order. No contract for the supply of goods will exist between you and Flitwick Mowers Ltd until Flitwick Mowers Ltd accepts your order by e-mail. That acceptance will be deemed complete and will be deemed for all purposes to have been effectively communicated to you at the time Flitwick Mowers Ltd send the e-mail to you (whether or not you receive that e-mail). For the avoidance of doubt, any such contract will be interpreted, construed and enforced, in accordance with English Law and will be deemed to have been concluded in England. Therefore, you and Flitwick Mowers Ltd irrevocably submit to the jurisdiction of the English Courts. Flitwick Mowers Ltd and its agents have taken every care in the preparation of the content of this web site. To the extent permitted by applicable law, Flitwick Mowers Ltd disclaims all warranties of any kind, express or implied, as to the accuracy of the information contained on this web site or the information, content, materials or products included in this site, including, without limitation, warranties of merchantability, satisfactory quality and fitness for a particular purpose. In addition, Flitwick Mowers Ltd does not represent or warrant that the information accessible via this web site is accurate, complete or current. To the fullest extent permitted by Law Flitwick Mowers Ltd shall not be liable for any loss or damage arising out of, or in connection with the use of this web site or the information, content, materials or products included on this web site. This is a comprehensive limitation of liability and it applies to all damages of any kind, including compensatory, direct, indirect or consequential damages, loss of data, income or profit, loss of or damage to property and claims of third parties. For the avoidance of doubt Flitwick Mowers Ltd does not limit its liability for death or personal injury to the extent only that it arises as a result of the negligence of Flitwick Mowers Ltd its employees or representatives. Unless otherwise specifically stated this web site is directed solely at those who access this web site from the United Kingdom mainland. If you decide to buy from Flitwick Mowers Ltd, during the ordering process, you will be transferred to the ‘ePayment’ secure payment site to enter your credit/debit card details. The ePayment secure site is provided by Cardsave Financial Services ltd and the payment is processed by Streamline which is provided by Natwest (owned by Royal Bank of Scotland Group plc). We will not be given your credit/debit card number. If you have any security concerns please do not hesitate to contact us. We recommend that you make all payments using the ePayment secure payment system. If you send us credit/debit card details using e-mail your details will not be encrypted and Flitwick Mowers Ltd cannot be held responsible for the security of the information you provide. Please take particular care with regards to entering your personal address information on ePayment. If your house has a name and a number then it is imperative that both are entered when inputting your address. Also, please take care to enter the post code correctly. Your address details MUST EXACTLY MATCH the billing address of your credit/debit card as recorded on your monthly statements. Payment will be rejected if these details do not match. Card Payments - All orders placed online must be paid for by credit/debit card. All card payments must be made using UK issued credit or debit cards with a UK billing address. We reserve the right to void or refund any payments made which do not fulfil these criteria. Card types accepted by Cardsave ePayment (our secure payment service provider) and processed by Natwest Streamline are Mastercard, Solo, Maestro UK, Visa Credit, Visa Debit, Visa Delta, Visa Electron and JCB. Bank Transfer - We can also accept payment by bank transfer (BACS/electronic transfer) directly into our account. If you wish to pay in this way please contact us and request to do so. We can supply our bank details so that you can make the necessary arrangements. Prices are correct at the time of publishing and are shown both excluding and including VAT. They are in United Kingdom pounds sterling. Availability can be subject to change without notice. If a product’s correct price is higher than the price stated on our site, we will normally, at our discretion, either contact you for instructions before dispatching the Product, or reject your order and notify you of such rejection. We are under no obligation to provide the Product to you at the incorrect (lower) price, even after we have sent you a Dispatch Confirmation, if the pricing error is obvious and unmistakeable and could have reasonably been recognised by you as a mis-pricing. Product images are reproduced courtesy of the manufacturers/suppliers and copyright remains with them. Images are for illustration purposes only and the actual products may differ from the images shown. You can always return items to us if they are faulty or defective. Please note that we only accept returns of items that have been opened if they are faulty or defective. In the case of a fault or defective product, when returning an item please provide a full description of the fault and return the defective item to us in its original packaging together with all warranty documents, manuals and accessories. For your protection we would recommend that you use a Recorded Delivery Service and they must be returned to our contact address at your own cost and risk. We will refund the price you paid for such goods within 30 days of the date of cancellation provided that the goods are returned by you and received by us in the condition they were in, when delivered to you. Our Returns Policy does not affect your Statutory Rights. You have the right under the Consumer Protection (Distance Selling) Regulation, to cancel your order within 7 working days, commencing from the day after the day you receive the goods. However, you must ensure that the goods remain unused and are retained in their original packaging unopened. If you wish to cancel a Contract, please email our returns department at sales@flitwickmowers.com We shall refund the total amount paid by you for the machine, less any costs to collect the equipment and any restocking fee reasonably incurred (not exceeding 10% of the price paid) within 30 days starting with the day on which we receive a notice of cancellation in writing from you provided that the item have been returned to us as stated above. Once you have notified us of your desire to cancel a Contract you have a legal obligation to take good care of the machine. You must return the equipment, to us at your cost, to Unit 7 Lyall Court, Flitwick Industrial Estate, Maulden Road, Flitwick, Bedford, MK43 1UX. We advise you to insure the machine for the return journey. If you have not returned the item within 14 days of cancellation, or if requested, we can collect it from you at your cost. Please note we do NOT offer a try before you buy service. We offer free delivery to the following postcodes LU1,LU2,LU3,LU4,LU5,LU6,LU7,MK1,MK10,MK15,MK16,MK17,MK2,MK3,MK4,MK40,MK41,MK42,MK43,MK45,MK5,MK6,MK7,MK9,SG15,SG16,SG17,SG18,SG5,SG6if you spend over £200.00. Otherwise you will need to come to our shop in Flitwick to collect. We aim to delivery products (provided stock items) ordered by you on any working day within 5 working days. We will take reasonable steps to meet the delivery date: however, occasionally delivery may be affected by factors beyond our control and so cannot be guaranteed. If you fail to take delivery of an order then, except where this failure is caused by our failure to comply with these terms and conditions we (a) will store the Product until delivery takes place and may charge you a reasonable sum to cover expenses, and (b) shall have no liability to you for late delivery. It is your responsibility to let us know if there might be any access problems for vehicles delivering the products that you have ordered. Particularly when larger machines are ordered as a lorry fitted with tail lifts may be used). Narrow lanes, low or overhanging trees, narrow entrances or the lack of a turning area are all examples of possible access problems. 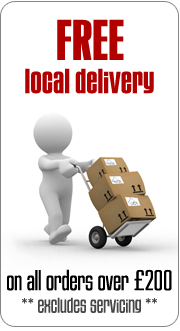 Any alternative or extra delivery arrangements that might need to be made will be at your cost. Deliveries are usually made on our working days only unless by prior arrangement. Please call us for more information. It is strongly recommended that all packages are inspected in front of the delivery driver prior to signing for them "in good condition". Where this is not possible, it is suggested that goods are signed for as "unchecked" or "damaged" otherwise claims against our carriers for goods damaged in transit are unlikely to be successful. Orders made where accessories are ordered without main product items may not be accepted or additional carriage charges may apply. A signature will be required on delivery as proof of delivery. The delivery person may ask for assistance in unloading the goods from his/her vehicle at the destination if he/she feels that such assistance is necessary for the safe delivery of the goods. This list is not intended to be exhaustive. Engines batteries and gear boxes can have different warranty periods to the rest of the machine. Details are available on request. 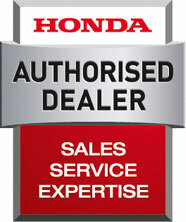 If you have any questions regarding warranties please do not hesitate to contact us.